Dental braces are used to correct problems with teeth such as crowding, too much space between the teeth, protruding teeth or bite problems. Once thought of as a treatment mainly for children, braces are now becoming common with people of all ages who wish to make the most of their teeth. Different types of braces will be used depending on the correction needed to the teeth. There are also different types of braces that will be less visible when they are worn. Braces work by moving teeth in a certain direction by the use of force. Bone remodelling occurs when stress to the periodontal ligament is achieved. The ultimate outcome is that the tooth or teeth will permanently move into the desired position over a period of time. This is the reason that braces need to be adjusted or refitted with a different size. When problems with teeth occur such as spacing, crowding and occlusion (bite), the consensus seems to be the earlier the treatment, the better. Treatment in the teenage years or younger years should eliminate the need for more complex work later on. However, there is no cap on the age limit at which people can have orthodontic treatments to their teeth. Teeth can still be corrected well into later life and the benefits to a person’s appearance and overall lifestyle will be worth the expense. Whether the patient will need a permanent brace or one that can be removed will depend on the condition of the teeth and age of the patient. Metal brace are made of stainless steel and are one of the oldest types of braces. This type of brace is relatively inexpensive compared to some of the more advanced braces. This type of brace does have aesthetic problems as they are visible when worn and have been known to stain teeth. A very popular alternative to metal braces due to their lack of visibility when worn. Made of composite materials, they look very natural when fitted and will not stain teeth. Ceramic or clear braces are also very strong but may need to be worn longer. If you are paying for your orthodontic treatment then this brace will be more expensive than traditional metal braces. Lingual braces are also invisible when worn as they are fitted behind the teeth on the tongue side. Commonly used to correct bites and straighten teeth, lingual braces may take a little more time to get used to. The plus side is that they are really invisible, the minus is that people getting used to them can cut their tongue and may have speech problems at first. There are even more advanced types of braces that are used to treat people with very minor problems. The more advanced types of braces are designed by computer and can be removed in order to clean after eating. Made of clear plastic, this type of brace cannot be adjusted but is made in different size levels as the orthodontic treatment progresses. The more advanced braces are expensive and dentists or orthodontists must be specially trained in order to work with them. A certain amount of commitment to at home dental hygiene is required by patients if they are to be fitted with braces. Food can easily become trapped underneath the brace and must be cleaned every day in order that decay and gum infection does not occur. There may be a very small risk of allergy to the materials used in braces, and people have been known to develop sores due to irritation from certain types of braces. If you do suffer from any of these problems, consult your orthodontist who will be able to advice on alternatives or remedies for any irritation that does occur. 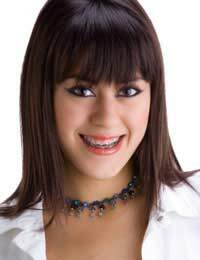 Braces have become quite commonplace in correcting teeth for people of all ages. The fact that you can now have invisible braces goes a long way to overcoming any embarrassment people may have previously had about this type of orthodontic treatment. Treatments can last anywhere from around six months to two years and the benefits in appearance and bite problems will be worth the time.